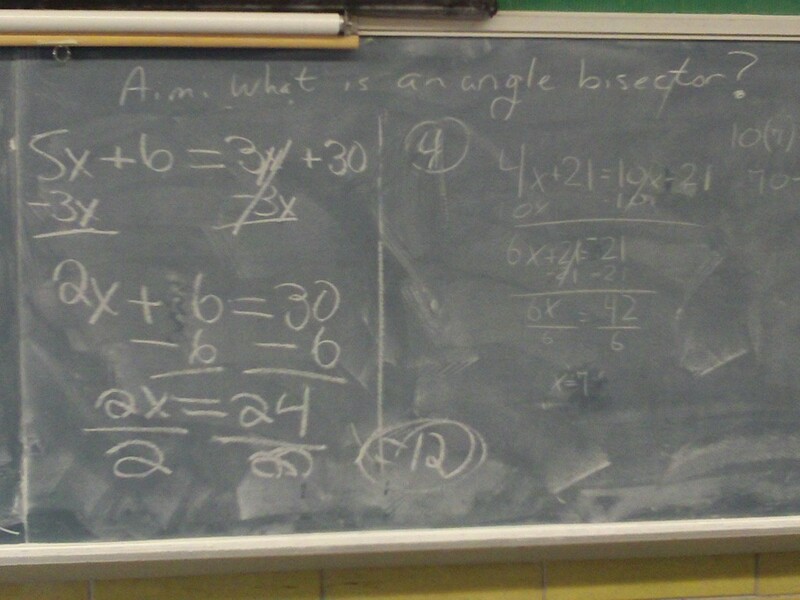 Welcome to all my new Algebra and Geometry students. This class page is open to everyone. Homework and assignments can be posted here along with other resources. There is a static page, which means it only changes when I update it. You cannot write on it. If you need to contact me, you can use the class blog. In the past, before we had Pupil Path, we had a class weblog. I haven't updated it because students were not using it, and it was taking too much of my time to maintain it. If students want to participate in class in this manner, I will use it again. The new site is http://nycedtech.com/cburke/. All the old messages and pictures have been copied over there. THIS IS YOUR PAGE, TOO! If you have anything that you would like to post on this page, or if you would like to help redesign this site, let me know. I can use, and would appreciate, the assistance. Thank you. 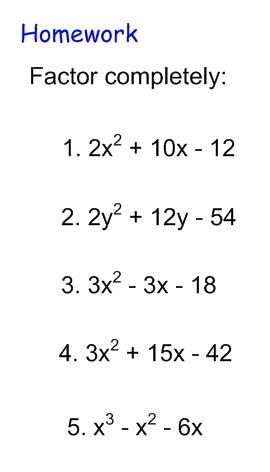 Here is the Integrated Algebra Term 2 - Calendar of Lessons. Here is the Geometry - Calendar of Lessons. There may be some modifications to come. You can make a video like this for extra credit, and I can help you film it and edit it. Take a look. 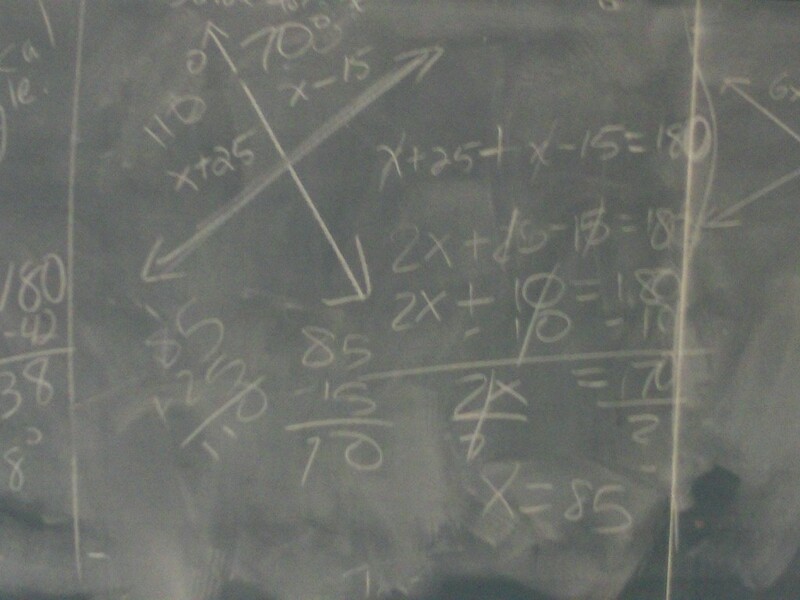 This math site can answer a lot of questions you might have. 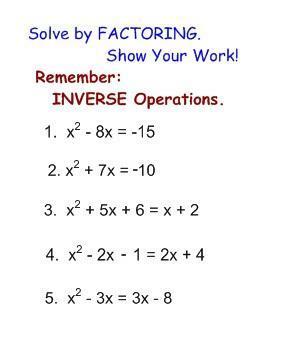 For example: 4x - 9 = 23. Use it wisely, and learn how to solve the problems. Don't copy them. Mathwords.com is an online dictionary of math terms. Refdesk.com is an online reference desk, good for help with all of your subjects. Send an email message to Mr. Burke. Please include your name and class in the message. 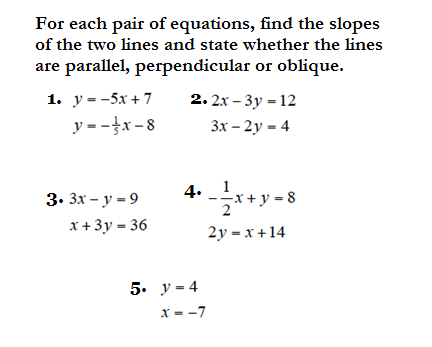 Homework: Rewrite equations in slope-intercept form.State the slopes of each line AND whether lines are parallel, perpendicular or NEITHER. 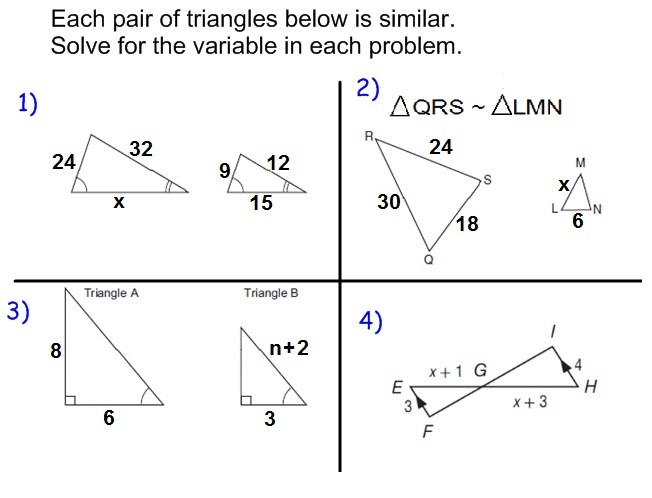 Do all three parts for each problem! 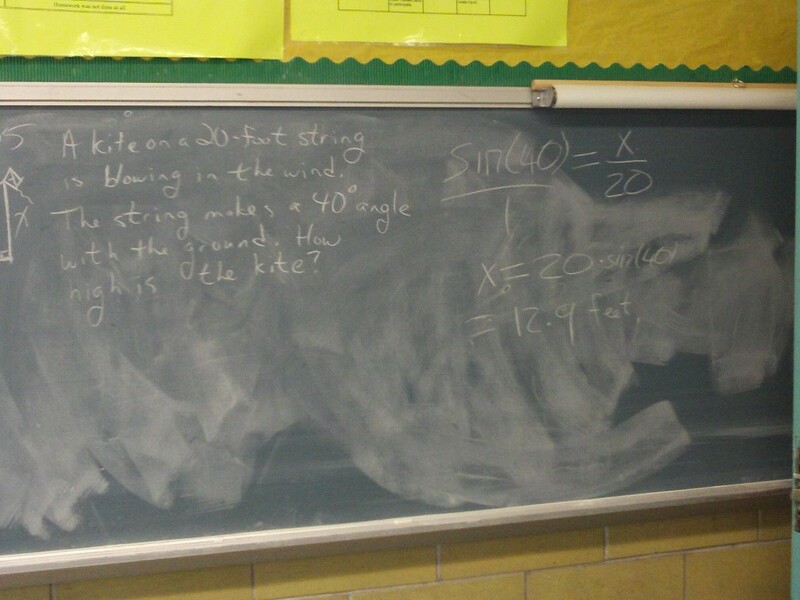 Rewrite equations in slope-intercept form. State the the slopes. 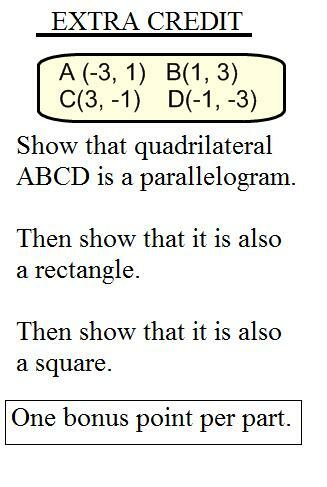 Answer the question: are they parallel? If the slopes are the same, then the lines are parallel. If the slopes are different (one positive, one negative or two different numbers, for example), then the lines are NOT parallel. 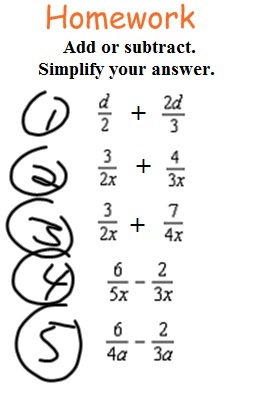 Don't forget to simplify fractions! 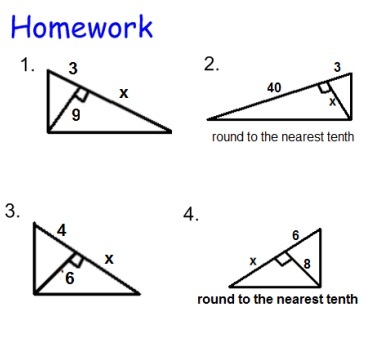 Students were allowed to finish the worksheet for homework. 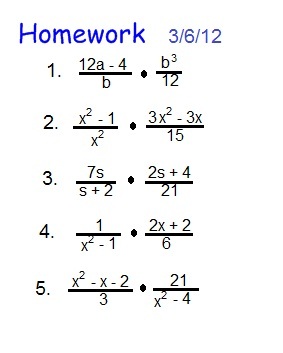 Classwork: This worksheet was a review of writing linear equations in slope-intercept form from the information given. 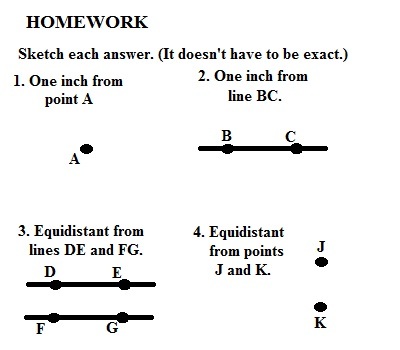 Homework: This worksheet on parallel lines. Fill in the tables and graph the lines on the same graph. 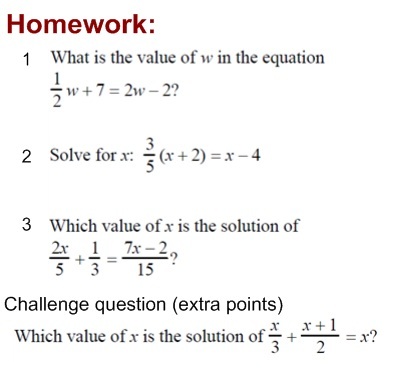 Homework: Rewrite equations in slope-intercept form. State the slopes of each line AND whether or not the lines are parallel. 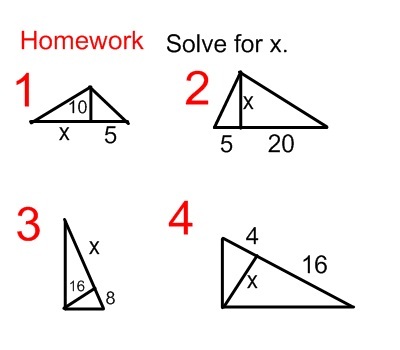 Students were allowed to finish the worksheet for homework, but that should not have been necesary. Homework: STUDY for tomorrow's exam. 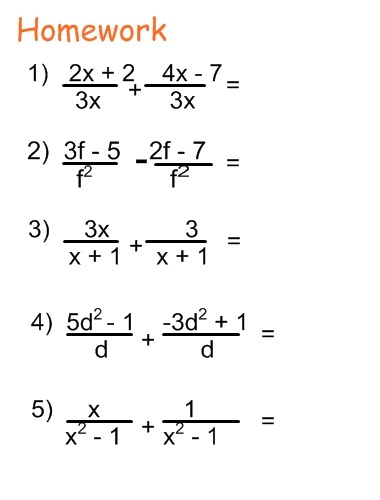 Classwork: This worksheet with six linear equations to graph. 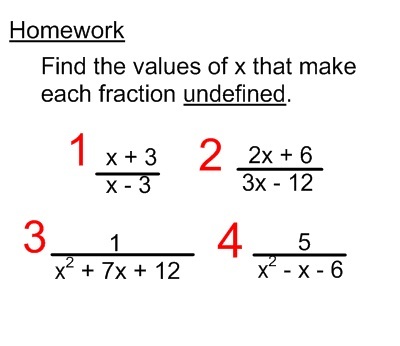 Classwork: Fill in Tables of Values for each of these equations and graph them on graph paper. 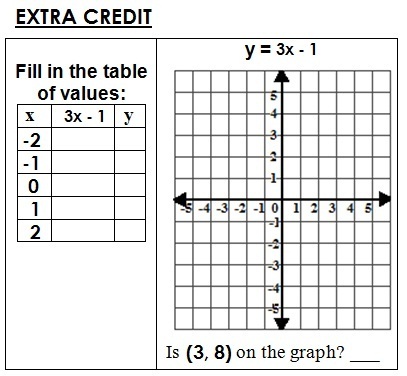 Homework: Fill in the tables and GRAPH them on your paper. 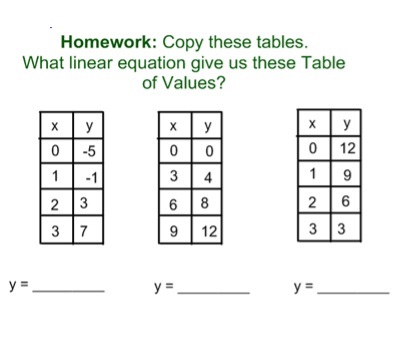 Include the Tables on your homework paper. 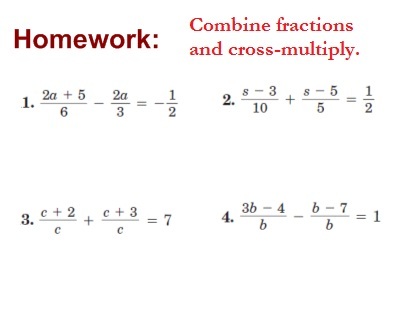 Homework: For each linear equation, come up with 4 ordered pairs, which are solutions. 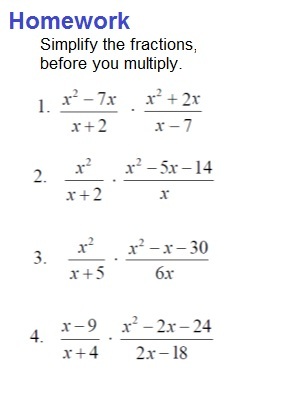 Ask Mr. Burke for copies of these worksheets. 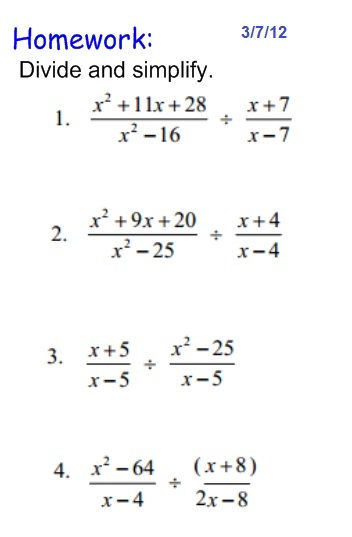 Classwork: Glencoe Practice Worksheet 8-3: Ordered Pairs, p 73. 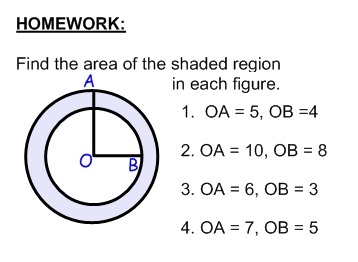 Homework: Glencoe Practice Worksheet 8-4: The Coordinate System, p 74. 2. Together, Sam and Janet are nine years old. What are the possible ages for each child? 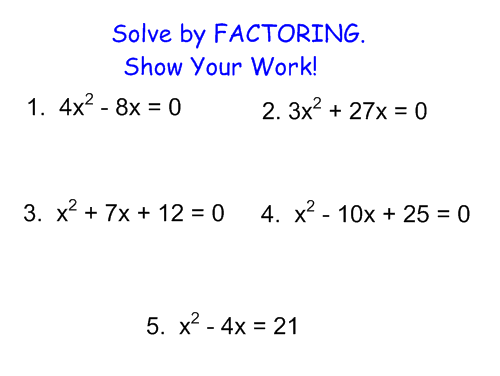 Worksheet with six problems: Division of Algebraic Fractions. If you didn't get a copy, see Mr. Burke. 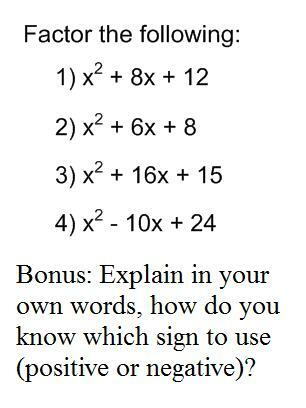 Write a 100-word essay: Copy the problem below and explain in one hundred words the steps you have to take to combine and simplify the fractions. 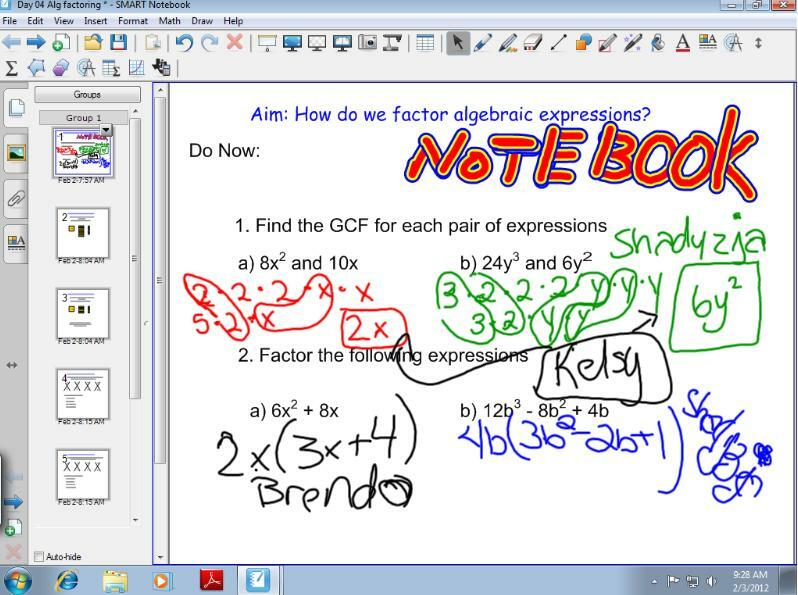 Copy the questions and answer them on loose leaf, or write them on the Class blog. ENJOY YOUR VACATION! And don't forget to do your assignment and have it ready when we get back! Wednesday: Study for the TEST on Thursday! Tell me that you came to this webpage, or write a message on the blog, for your first extra credit assignment. Assignments are NEVER this easy, so take advantage of it. Under translation T4, -3, where is the image P' of P(-1, 2)? 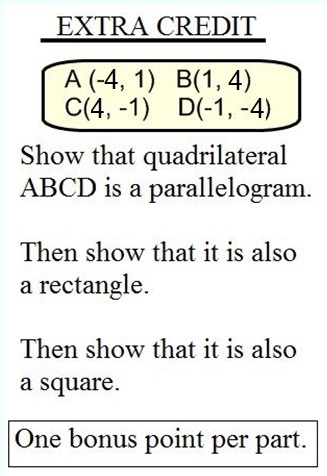 Under translation T5, 4, where is the image Q' of Q(3, 3)? Under what translation is R'(5, 1) the image of R(1, -2). What is the reflection of the point (1, 5) in the x-axis? What is the reflection of the point (-3, 4) in the y-axis? What is the reflection of the point (2, -3) in the origin? 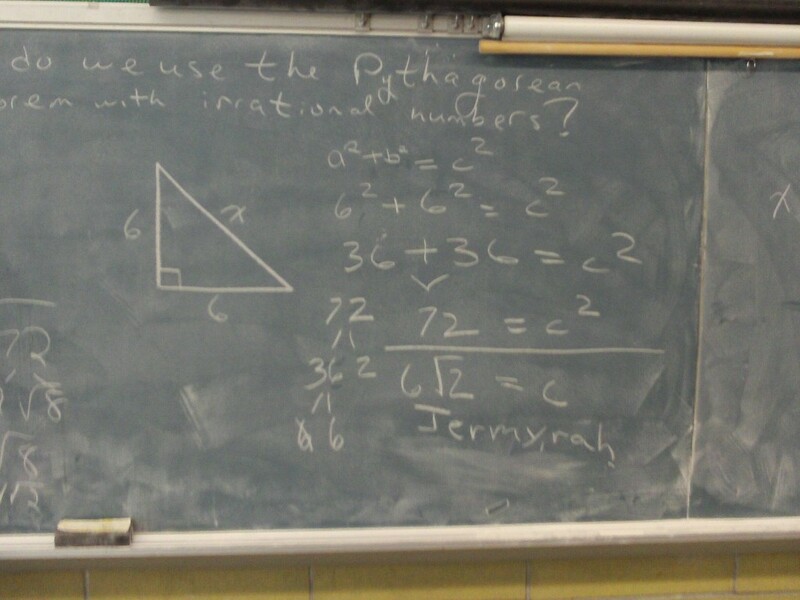 What is the reflection of the point (6, 2) in the line y=x? 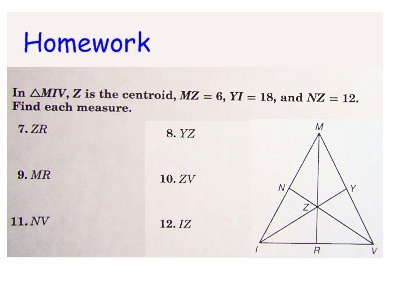 Classwork: This worksheet on Reflections in Geometry. 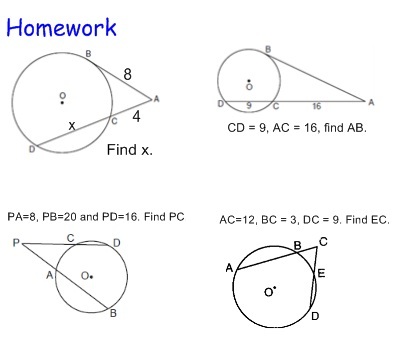 Homework: This Regents worksheet on Reflections in Geometry. 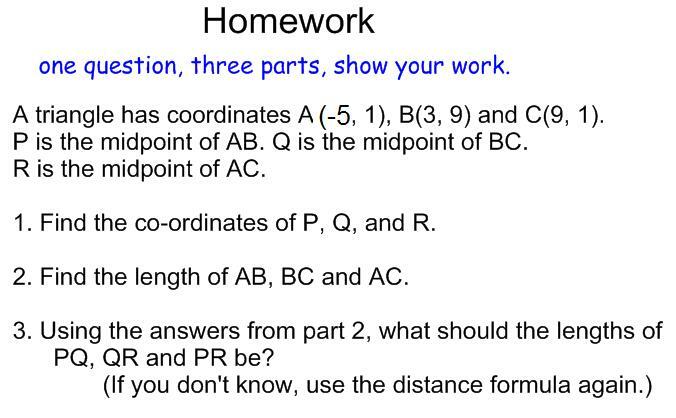 Classwork: This worksheet on locus of points. 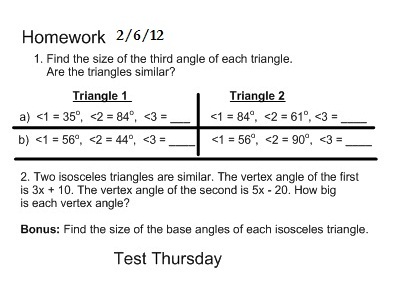 Classwork: This review worksheet for tomorrow's exam. If you have problems opening the file, please, see Mr. Burke for a copy. 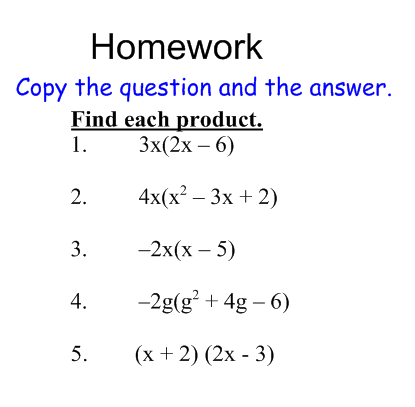 Homework: Finish the worksheet, if you didn't hand it in at the end of class. Don't forget to hand it in. Classwork assignment are worth more than homework assignments! 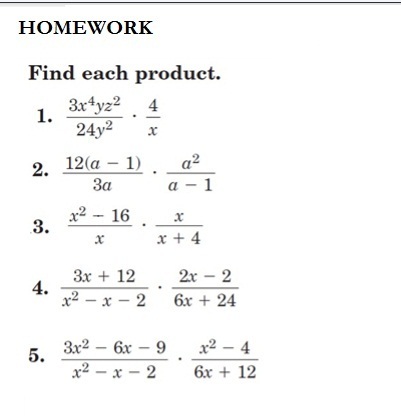 Homework: Finish the worksheet, if you didn't hand it in at the end of class. 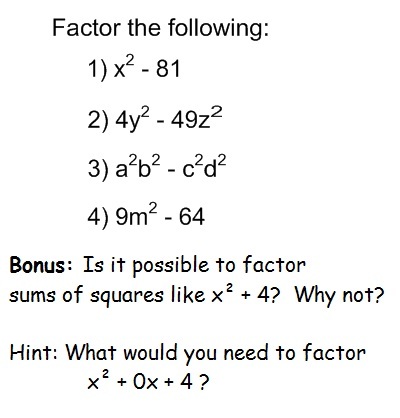 Do the fraction problems. They are important. GG 72: Equations of Circles. 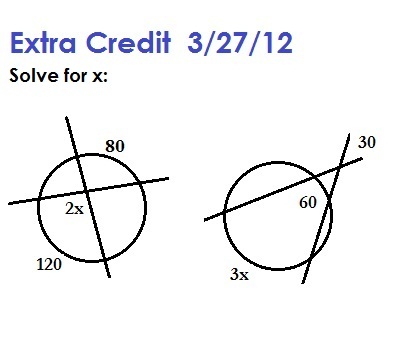 Worksheet with four Regents exam questions, identifying the equation of a circle from a picture of its graph. 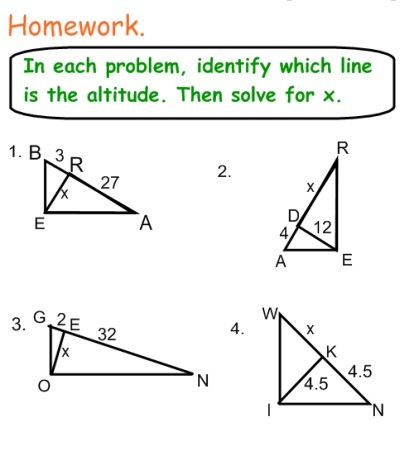 In class, we started a worksheet, entitled "Practice 7-5: Proportions in Triangles". There was a lot of work, so part of it will count as a class grade and part will be graded as homework. 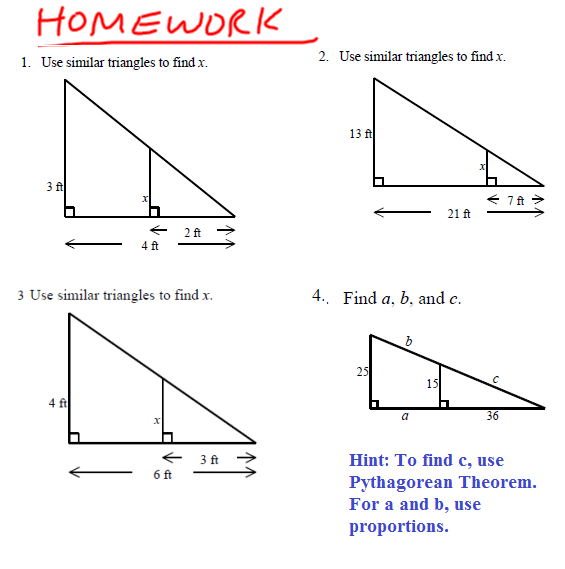 TEST THURSDAY Topics: Similar triangles, midsegments, proportions, right triangle altitude theorem. 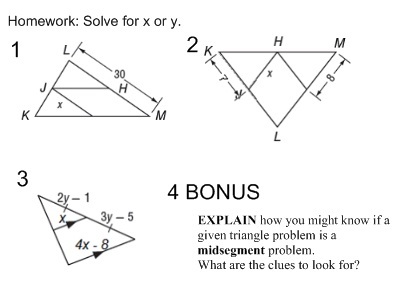 Get a copy of the Midsegment worksheet from Mr. Burke. The front of the worksheet will be graded as classwork. 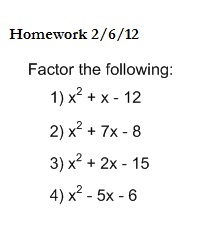 The back of the worksheet will be graded as homework. This assignment cannot be uploaded. Please, pick up a copy. Copy the questions and answer them on loose leaf, or write them on the Class blog.